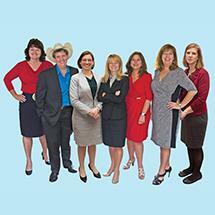 The Women's Legal Group at Tucker Griffin Barnes in Harrisonburg, Virginia, provides a variety of skilled legal services. Our practice areas include criminal defense, disability law, workers' compensation, personal injury, family law, bankruptcy, landlord-tenant and estate planning. Whether you need aggressive criminal defense representation or strategic counsel for a lawsuit or legal concern, we can help. We represent clients throughout Virginia. The Women's Legal Group at Tucker Griffin Barnes is a full-service law firm composed of experienced and accomplished female attorneys and staff. We focus on providing our clients with competent, compassionate and effective legal counsel and representation. We know that facing legal problems is overwhelming and stressful and the stakes can be very high. We are dedicated to providing our clients with the high-quality legal representation they need to reach the best possible outcome. Each of our lawyers concentrates on only one or two areas of law, and we believe this high level of focus benefits our clients greatly. When you need a lawyer you can count on to provide you with excellent representation regarding criminal defense, family law or any other legal matter, you can count on The Women's Legal Group at Tucker Griffin Barnes. Call 540-217-4173 today to schedule an initial legal consultation with a member of our team at our Harrisonburg office or a location more convenient for you.